These numbers reflect estimated student expenses for the 2019-2020 school year. Amounts will change slightly from year to year, but as the cost of college increases, the scholarship packages will correspondingly increase. Your official financial aid award will be included in a letter directly from Haverford. Haverford will use a portion of any outside funding received to reduce the summer work contribution and/or work-study requirement. Please visit Haverford's website here for the full explanation of Haverford's policy on outside funding. Haverford requires all students to have health insurance, either through their parents or another plan. If a student is not covered by a parental plan, Haverford will make arrangements with the student to provide coverage. 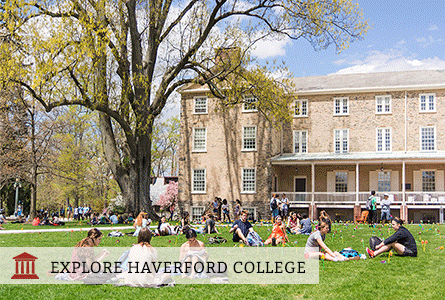 For students living outside of a 300-mile radius of the College, Haverford adds a travel allowance to the estimate of the total cost of attendance, and in turn increases the student's amount of Haverford College grants. This money is applied to the student's college bill and is not issued as a refund. Travel allowances outside the U.S. are not provided. All students receiving financial aid from Haverford - including Match scholars - must reapply for aid every year. As long as a Match scholar continues to qualify for need-based financial aid, the terms of the Match Scholarship package will not change. The expected summer work contribution for the 2nd – 4th years is $2,400; the expected work-study contribution for the 2nd – 4th years is $2,300. The required fees above include an orientation fee that is only applied in a student's first year. Students are expected to contribute 25% of their personal savings toward college expenses. This contribution will decrease the amount of the Haverford grant dollar for dollar. At Haverford, 50% of students receive some form of financial aid. Use Haverford's Net Price Calculator to estimate the financial aid for which you are eligible.